The site of Bedd Branwen by Eric Jones (Geograph). Os grid reference: SH 3611 8498. In a farmer’s field close to the west bank of Afan Alaw (river Alaw) near the hamlet of Glanalaw, Treffynon, Anglesey, stands the Bronze-Age ring-cairn known as Bedd Branwen, which is said to date back 4,000 years. It is named after the legendary princess Branwen or Bronwen, the daughter of King Llyr, and sister of Bran the Blessed (Bendigeidfran) from the Mabinogian. She was related to King Arthur. 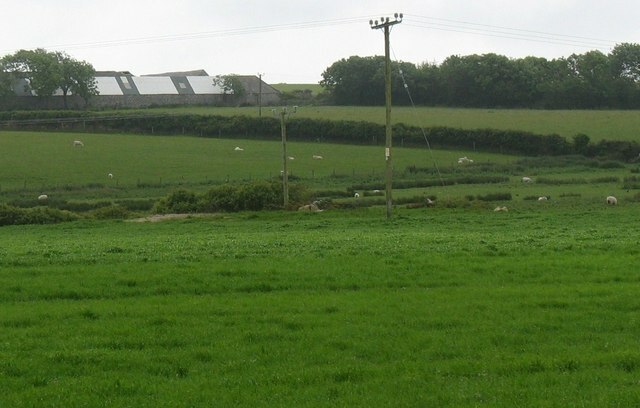 The cairn site is located on private farmland to the south-west of Bod Deiniol farm, close to the west bank of Afon Alaw – roughly half a mile south of Glanalaw, although a track/footpath runs past Hafan to Glanalaw hamlet and reasonable viewing looking south across the fields can be had from [here] with good zoom photography. However, you can probably walk across the fields to the cairn as long as the farmer doesn’t mind! The village of Treffynon is 1 mile to the east of Bedd Branwen, while Llanbabo and its ancient church are about one-and-a-half miles to the north-east. Described as a ring-cairn or round barrow approx 24 metres by 28 metres – the kerb of which is still visible at the outer limit of the circle with a large, chunky standing stone (cist grave) at the centre which is now, sadly, cracked down the middle. The monument was apparently damaged back in 1813 by a local farmer who needed some stones for his house; at this time an urn was also dug up which was ‘said’ to have contained the ashes of a female – could these ashes have been those belonging to Branwen, the fairest and most beautiful woman in all Wales, if not the whole of Britain. Or, according to another account: she is one of the three most beautiful women in Wales! But in reality the cairn pre-dates the legendary princess Branwen by a few thousand years or more, and other urns with grave-goods have been excavated here in more recent times – the early 1960s in fact. These urns almost certainly date from the Bronze-Age at around 2,000 BC. So, perhaps the discovery of the ashes of a female purporting to be those of the princess were ‘just a coincidence’. Today nothing is left of the earthern mound that once covered the cist grave, only the outline of this being still visible and some stones around the edge, though there are a few other curious stones in this field which ‘might’ well be associated with the monument. In the early 1960s excavation some more cremation urns were dug up along with pottery, grave-goods, and also a necklace made of jet. These antiquities are housed in Bangor Museum in north Wales. In the work ‘The Ancient Stones of Wales’, author Chris Barber describes the monument as a “dolmen” and also referrs to it by another name: Bod-Deiniol. Branwen is a legendary and mythical character who figures strongly in the Mabinogian along with her father King Llyr (Lear) and her brother Bran the Blessed, who is known as Bendigeidfran in Wales, but it is a very sad tale. Princess Branwen is given in marriage by her brother to the Irish king, Matholwch, but after an insult to the Irishman by her half-brother, Efnisien, they soon begin to quarel and then fall out, and poor Branwen is treated badly by being put to work as his cook. Bran then makes war on Matholwch but is killed in the battle (MacKillop, 1998). Later, she manages to escape back to the Isle of Anglesey where ‘she dies of a broken heart’, and is allegedly buried beneath the mound and cairn that now bears her name (Bedd Branwen). According to The Mabinogian (second branch) Bran the Blessed is credited as going on a voyage across the Atlantic Ocean, but life ends badly for him; his severed head is buried on Tower Hill in London which then acts as a sort of talisman for the city against foreign invasion on the grounds that Britain should not rely on magic, according to the author Geoffrey Ashe in his work ‘The Quest for Arthur’s Britain’. Traditionally Bran is recorded as being the son of Belinus (Gruffudd, 1980). If that is the case, then he and his sister Branwen are descended through Manogan, King of Britain, with the Blessed Virgin Mary? And Belinus or Beli has sometimes been identified with the Celtic sun god of that name. But as we know the Mabinogian gives the father of Branwen and Bran as King Llyr, who has sometimes been identified with the legendary King Lear of Shakespearean fame. Gruffudd, H., Enwau Cymraeg I Blant – Welsh Names For Children, Y Lolfa, Talybont, Dyfed, 1980. MacKillop, James., Dictionary Of Celtic Mythology, Oxford University Press, Oxford, 1998. Photo Credit: http://www.geograph.org.uk/photo/1358949 © Copyright Eric Jones and licensed for reuse under this Creative Commons Licence. Categories: Burial Chambers / Cromlech / Dolmens, Cairn / Cairn Circle, Misc Subjects | Tags: Bedd Branwen at Glanalaw in Anglesey | Permalink. Thanks for finally talking about >Bedd Branwen, Glanalaw, Treffynon, Anglesey | The Journal of Antiquities <Liked it!